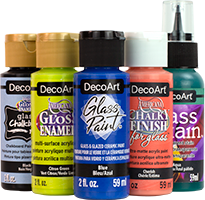 Glass Stain™ is a high-quality, transparent stain for use on glass and plastic. 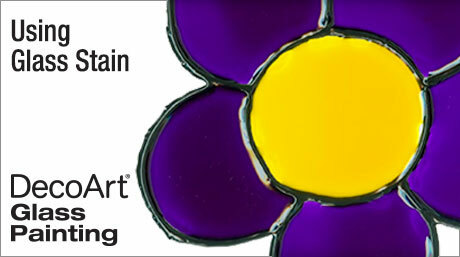 Use these transparent colors combined with leading paint to create suncatchers and custom stained glass designs. 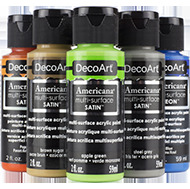 Glass Stain comes in 12 bright, translucent colors that dry to a glossy finish. Outline designs to create custom, ornate, stained glass art. 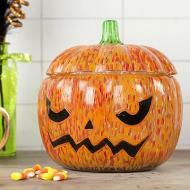 Apply Glass Stain to surface with bottle's writer tip or with a brush. Dry flat for 24 hours. Use for decorative purposes only. Not for direct contact with food. Hand wash painted items, and do not soak. Cleans up with soap and water while wet. Hold the bottle's tip slightly above the surface as you work for best results and smoother lines. Use a consistent pressure to make a thick line to hold in the Glass Stain. Make sure Glass Stain touches the leading and the section is filled completely when filling a leaded design. Otherwise, as Glass Stain dries, areas may pull away from the leading, creating gaps in coverage. Use a toothpick to pop air bubbles or a small brush to scoop them out if they appear while the paint is still wet. Use a toothpick to mix colors and create interesting effects directly on the surface. Place drops of various colors in one section at a time, then use toothpick to swirl colors together. To clear a clogged writer tip, remove the cap and insert a toothpick from the inside of the cap to push the clog out. Be careful not to insert the toothpick from the outside in, or you will push the clog back into the bottle. 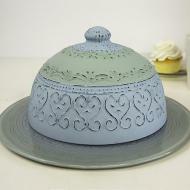 Get inspired with our craft and DIY project ideas made with our various glass paints.